Frame Replacement with MEDIUM Cushion (includes headgear clips but no headgear) - SHIPS FREE! FrameReplacement with LARGE Cushion (includes headgear clips but no headgear) - SHIPS FREE! Frame Replacement with LARGE WIDE Cushion (includes headgear clips but no headgear) - SHIPS FREE! Frame Replacement, STANDARD with Headgear Clips (No Headgear and no Cushion) - SHIPS FREE! Cushion Replacement, MEDIUM with Clip - SHIPS FREE! Cushion Replacement, LARGE with Clip - SHIPS FREE! Cushion Replacement, LARGE WIDE with Clip - SHIPS FREE! Frame Replacement with SMALL Cushion (includes headgear clips but no headgear) - SHIPS FREE! Cushion Replacement, SMALL with Clip - SHIPS FREE! Replacement parts for ResMed CPAP Nasal Masks, including Activa LT Accessories like nasal cushions, nasal mask frames, and nasal mask headgear. 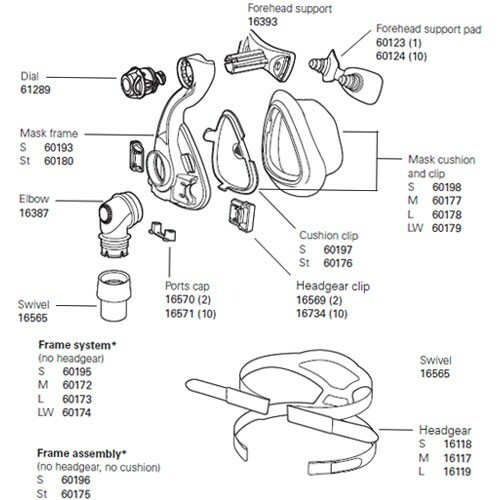 Activa™ LT Replacement Parts include frame assemblies, mask headgear and cushions. Vitality Medical Offers Toll Free Phone Support 8 am to 5 pm MST and Email Support. Access to Nurse on Staff. Access to Vitality Medical Blog. Vitality Medical is solely responsible for advertisements, marketing, pricing, delivery, and any included product setup independent of the manufacturer, ResMed. This item Requires a Prescription. This item is intended for sale to patients residing in the U.S.A.
© ResMed 2016 Used with Permission. It worked as I expected.